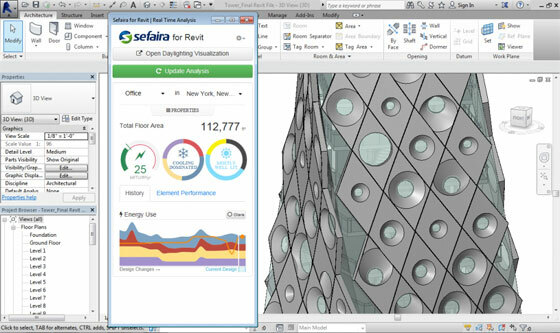 Sefaira, leading developer of high-performance building design software, has just introduced Sefaira plug-in for Revit that extends the BIM epitome through cloud analysis. This latest plug-in facilitates the “One-model” vision that is well recognized amid several firms. There exist an energy analysis window within the plug-in that contains building properties and category wise energy utilization. The Sefaira plug-in for Revit comes up with real-time energy analysis as well as daylighting analysis inside modeling surrounding of Revit. The designers will be able to incorporate the building performance assessment into their collaborative design development by applying the astuteness of the Revit model to obtain supplementary information concerning building performance. Sefaira for Revit empowers the architects to evaluate tradeoffs involving energy and daylighting performance and generate performance-based design decisions directly in their design surrounding, devoid of applying specialist modelling tools. The designers can avail instant view on energy and daylighting performance that equalize the workflow and rapidity of the architectural design progression. Sefaira for Revit also offers standards for energy targets like 2030 Challenge targets and reductions from Chartered Institution of Building Services Engineers (CIBSE) to facilitate designers maintaining these targets in view and ensure projects are heading in the right direction. With Sefaira for Revit, it becomes easier for designer to apply various building performance scenarios at initial phase in Revit to identify the orientation and envelope of the building at the early phase of the design and get rid of the expensive and prolonged model alterations.